"Head and Neck Cancers" by James Liebmann, Ali Akalin et al. Citation: Liebmann J, Akalin A, Puscas L, Chen A, Pieters RS. Head and Neck Cancers. In: Pieters RS, Liebmann J, eds. 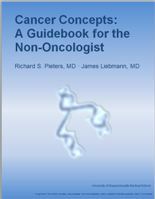 Cancer Concepts: A Guidebook for the Non-Oncologist. Worcester, MA: University of Massachusetts Medical School; 2019. doi:10.7191/cancer_concepts.1021.